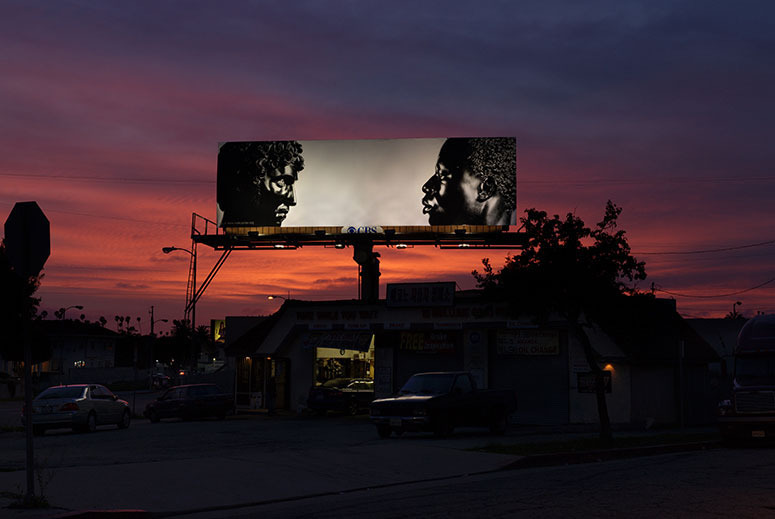 Home › Bibliography › Art is the Message of these Billboards. Art is the Message of these Billboards. Los Angeles Times, 20 Feb. 2010, Los Angeles. A grid of blue diagonals, the profiles of two men confronting each other, a series of colorful vertical stripes with an embedded phrase — these will be some of the enigmatic images flashing through our peripheral vision while driving in L.A. over the next six weeks. They are three of the 21 visual artists’ billboards that have been going up in some of the most trafficked corridors of Los Angeles, part of a long percolating idea of Kimberli Meyer, director of the MAK Center for Art and Architecture at the Schindler House. Meyer arrived in Los Angeles from Chicago in 1993 to study for a master’s in fine art at California Institute of the Arts. ‹ State of Mind: A California Invitational.